Ever heard the saying “The beauty is in the process?” Well, in terms of hardwood floors maintenance, this is certainly true. After you have installed and finished your floors, the next step is enjoying them. If you take the proper precautions your floors can and will last a long time for your enjoyment. You should always follow the cleaning directions of your floor’s manufacturer, as failing to do so can void your warranty. 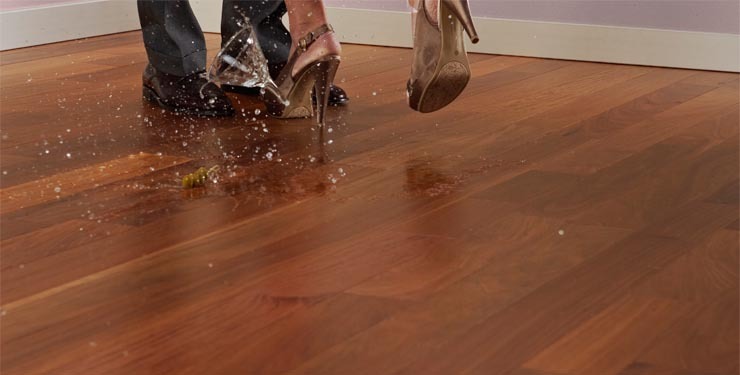 Some universal tip on wood floors: Too much water and moisture can ruin your floors, so keep away from the water bucket and focus on dust mopping your floors for regular maintenance. For extra cleanliness you may vacuum your floors weekly (set with the bare floor setting) and use a wood cleaner monthly. Wipe up spills immediately with a mildly dampened cloth. Do not use vinyl or tile cleaners on wood floors. Use throw rugs at doors and other entry ways to stop small debris and grit from coming in and scratching the floors. Do not wet-mop or use steam mops on your wood floors. This can damage the finish and damage the wood boards. Add stick on felt pads on furniture legs to prevent scuffing and scratching. Remove them when too much dirt has been trapped under them. Do not slide heavy furniture on the floors to prevent scratches. Place an area rug around the kitchen sink area to protect from water Do not walk on your floors with cleats and high heels. The impact can damage the floors. If you have any specific questions about maintaining your floors you should look for a licensed installer or directly to the manufacturer of your floors. Information is everywhere, but you should not trust advice unless it comes from a professional.